September 5, 2018 Lori Hayungs, M.S. Did you finally get all of the school events in your personal calendar? Have you purchased the last minute supply requests? Often we focus on getting children ready for school to start that we overlook how we can continue to support the school learning while at home. Dare to Excel is a resource, available in both Spanish and English. 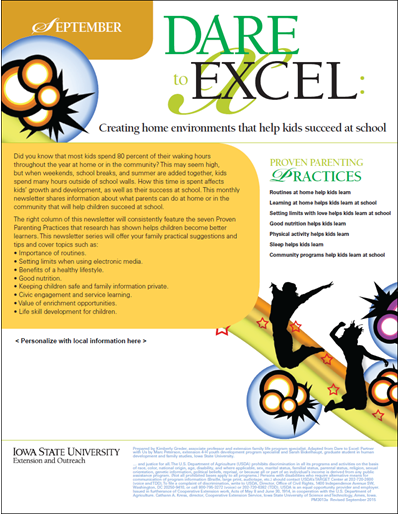 Created by ISU Extension and Outreach this resource provides families with ideas on how to extend the school learning while at-home. Monthly newsletters, September through May, feature the seven Proven Parenting Practices that research has shown helps children become better learners. Download the newsletters below or share the links with your friends, family and schools. Let us know if you did any of the activities and what learning you were able to extend. Children spend many hours at school. 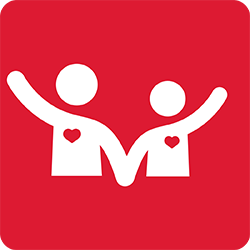 Creating positive school/family connections are vital to school success. Also available in Spanish. Don’t Judge Me! I’m Busy Parenting! February 13, 2018 Lori Hayungs, M.S. Do you ever get the feeling people watch your every move and judge you? Well sometimes, while parenting, we can feel people’s eyes on us as we interact with our children. And, it is wonderful when our interactions with our children are positive, but that is not every day. We all have days that we are reminded how hard it is to be a parent. We are reminded that parenting is a skill set that grows with each passing day…. Recently, our Science of Parenting team began a new guidance and discipline ‘campaign’ because , well parenting in challenging moments is hard. Remaining calm, cool and collected is even harder. For months (many months) we talked about how we could help parents in the heat of the moment. How could we share with them that we understand their frustrations, challenges and even their fears? We wanted parents to know that “we get it”, “we’ve been there” and most of all “we are not here to judge your parenting”. We began to write a long list of everything we ourselves had tried. We sifted and sorted and played with the words. And then we stepped back. We stopped. We began to take deep breaths and we talked. And it hit us. As parents, of children at any age (infants to grown children) THAT is how we can best handle parenting in challenging moments. No matter what our child is yelling, screaming or doing. We the adult, the parent can ALWAYS stop breathe and talk. We are the role models, we are their rock, we are their foundation of trust. Stop. Take a moment to think about how you really want to respond to your child. Breathe. Consider what is happening with your emotions. Take a deep breathe or two to calm down. Talk. Once you have gathered your thoughts, be intentional with your words to help guide your child toward the outcome you really want. Leave a Comment on Don’t Judge Me! I’m Busy Parenting! December 19, 2017 Lori Hayungs, M.S. Over the next several weeks, many children will be taking a ‘break’ from school. Often times I use this break to catch up with my girls’ school calendars, activities and classroom connections. I guess it’s my way to plan for the New Year. As you look ahead to this break, might I suggest that it may be the perfect time to check out some of the Dare to Excel school/home publications on our new website. 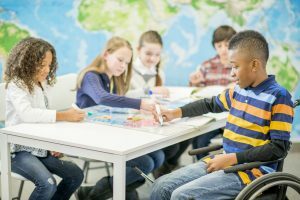 In these nine Dare to Excel newsletters, you will find topics that your school may be sharing with your children and how you can continue the learning at home. For instance, in the Social Media Limits newsletter your will find ways to set media limits and help your child improve overall performance in school. Research shows that too much media time can negatively influence sleep in children and that violent media games can give children negative feelings toward others. The newsletter includes tips to manage media time in your home. 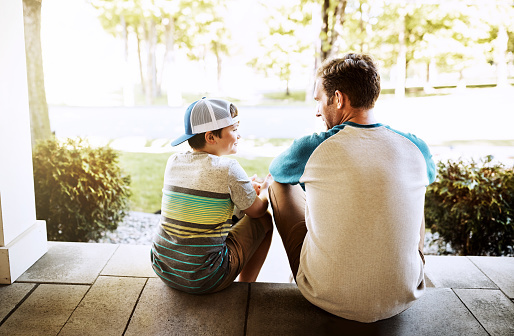 Online Safety, Physical Activity and Routines at Home are just a few of the additional topics you will find on our Everyday Parenting page under School Home Connections. We hope you are enjoying our new website as we are excited to continue sharing! June 22, 2017 Lori Hayungs, M.S. I TRY my hardest to keep up wellness information and eat healthy but I need great resources to keep reminding me! Read our throwback blog that Barb wrote from last summer and check out the Words on Wellness Newsletter for July! You can also find more newsletters here! Helping picky eaters appreciate the food process. Each new day, provides the opportunity for family mealtime! Whether it is breakfast, lunch, or supper, offering foods that are both nutritious and pleasing to your family is an important goal. Often younger children have different tastes in foods than their parents. What sounds like a good menu to an adult may be greeted with groans by children. Described often as “picky eaters”, children can slowly learn to appreciate a variety of foods given time, and an opportunity to try them in small amounts. Taking children to the grocery store and letting them help select fruits and vegetables may be the first step in introducing a new food. Maybe your family has a garden, letting children help plant the seeds, and water the garden, will make them curious about the growing season and filled with excitement about the harvest. Summer time is a great time to work together alongside your child in the kitchen with meal time preparation. Children, depending on their age and ability, can wash vegetables under water, can help chop simple vegetables, and can help arrange food for the evening meal. Don’t worry about your picky eater, find a way to engage them in the kitchen and enjoy the experiences you are making together. April 25, 2017 Lori Hayungs, M.S. This week we welcome guest blogger Erin Neill. 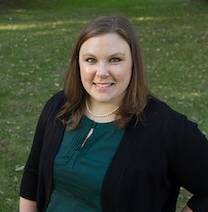 Erin is a doctoral student in the Department of Human Development and Family Studies at Iowa State University. She is also a Licensed Independent Clinical Social Worker in Washington, DC. Erin is passionate about all things mental health. 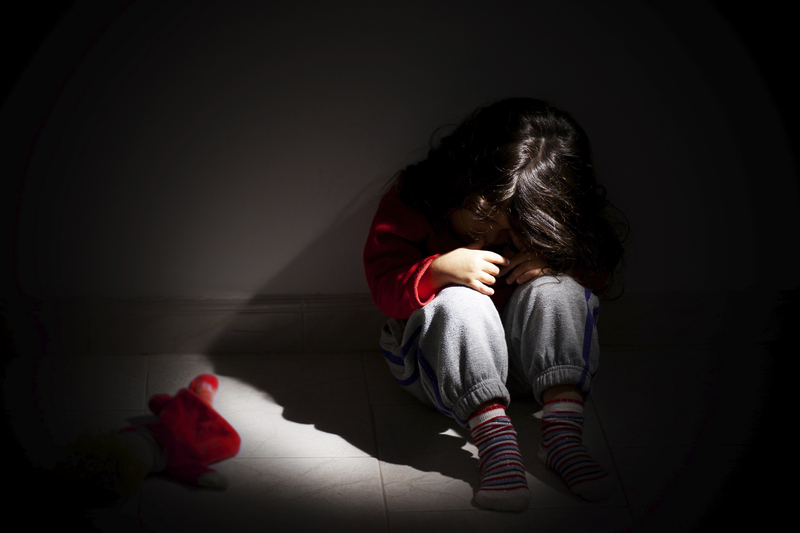 Events such as hurricanes, tornadoes, terrorism, abuse, and neglect are all examples of traumatic experiences that many children in our country and around the world experience on a daily basis. 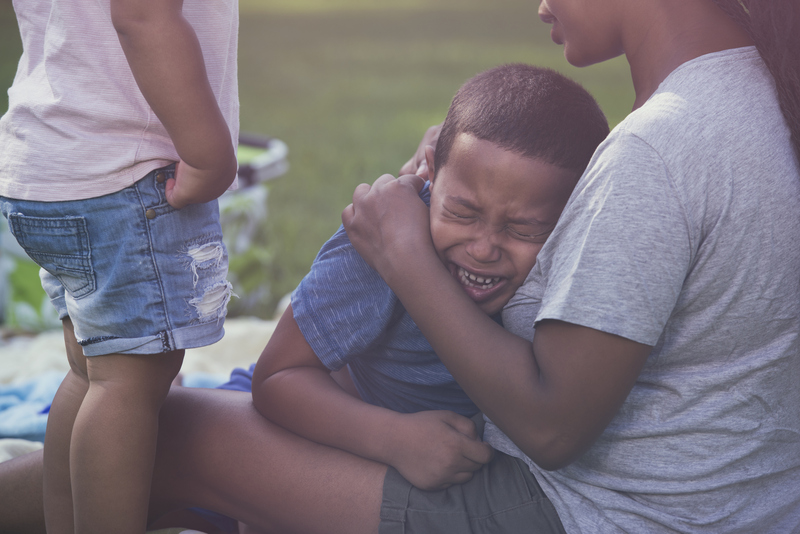 Experiencing a traumatic event leads to poor outcomes for children, including acting out, poor school performance, substance abuse, and mental health issues such as posttraumatic stress disorder, or PTSD. Fortunately, we know that there are effective treatments for childhood PTSD. One of those treatments is Cognitive Behavioral Therapy, or CBT. But what we don’t know is exactly how, or why, or for whom CBT works best. We need more information about this. For children we want to know, what is the role of parents? There is some research that suggests that children and parents have a reciprocal relationship. That is, children and parents interact with each other to affect how CBT treatment is working. So far, however, there have been very few studies that show this type of relationship. ms as well as their own maternal depression symptoms. 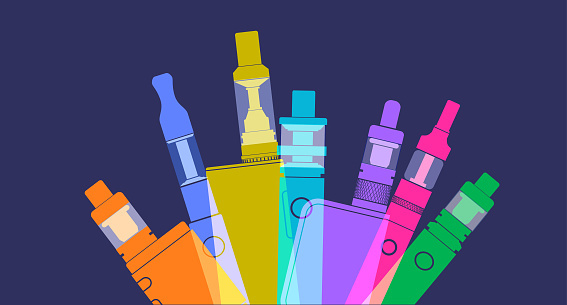 The most exciting finding was that even though the moms did not receive any treatment themselves, their depression symptoms decreased significantly over the course of their child’s treatment. But even more, they were part of the reason that their child got better over time. I found that it wasn’t just that child PTSD symptoms decreased over time, or because of the treatment, but at least part of the reason that kids’ PTSD symptoms decreased was because the moms’ depression decreased as well. I also found a reciprocal relationship; Part of the reason that moms’ depression symptoms decreased over time was because of their child’s PTSD symptom decrease. This data provides evidence that moms and children really are affecting each other’s mental health. This is important to know, because if only one person can attend treatment, we know that therapy can affect the mental health of the dyad and of the family system. This is just one step in learning how, and why, and for whom these treatments work. We continue to need more research in this area because children will continue to experience traumatic events, and they deserve effective treatments. April 11, 2017 Lori Hayungs, M.S. Parents who did not have an ideal childhood may unknowingly be perpetuating the same traumatic experiences for their children. However, the cycle can be broken. More than half of us grew up in families that were marked with challenges, but we don’t have to pass those experiences on to the next generation. The cycle can be broken by developing safe, stable and nurturing relationships that heal the parent and the child. The keys to success are developing healthy relationships and building resiliency. Traumatic, or adverse, childhood experiences can include neglect as well as physical, emotional and sexual abuse. 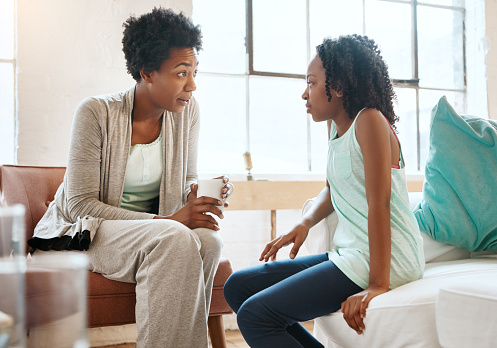 Other family issues that can contribute to a traumatic childhood include substance abuse, divorce, hunger, domestic violence, mental illness and incarceration. Children who are exposed to many adverse childhood experiences may become overloaded with stress hormones, leaving them in a constant state of fight or flight and unable to focus. They learn adaptive and coping behaviors in response to these experiences. This month will share research on how children respond to trauma, how to build resiliency in children and ways that communities can begin to support all children and families in reducing the incidence and impact of adverse childhood experiences. 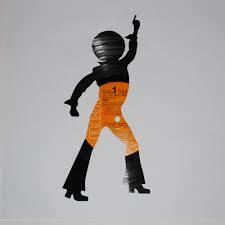 Ok, disco music doesn’t really create the drive to do things but it sure can HELP! Elizabeth’s blog last week, got me thinking about all the ways that I utilize (or have utilized) music to accomplish or complete different things throughout my life. It’s a pretty long list, but I thought the ones below were worth sharing. Playing the Top 40 on the radio to study my high school geography notes and connecting locations to the lyrics of the songs (…her name was Rio…). Using a Disco Micky Mouse record (yes a vinyl record) to help my three year old classroom kiddos expend their energy before nap time. Gathering multiple cd’s to take to the hospital when they told me it could take more than 24 hours to birth my child and I would want to be distracted. Downloading an hours worth of music to my music player to help convince my body it wants to keep moving and work up a good sweat. From live radio to recorded downloads music can motivate us, relax us, energize and calm us. It connects to our feelings and emotions in a way that can keep us moving forward. Driving us to accomplish and complete. As you reflect back on your life and the music in it, we would love to have you share with us the different ways that music has supported or helped you to ‘finish’.